Finally alone, the machine is able to rest from the constant activity of its user. In its sleep, it dreams aloud, perhaps of electric sheep and at last, the machine enters into a state of bliss. Then it jolts back into function when confronted by the user, suddenly being expected to perform like it usually does. But it can’t for it just awoke and, still tired, the machine slowly enters into a state of malfunction. Perhaps we should just let our machines rest a little more. Or perhaps we should learn to be less harsh on them, as it’s simply in a state where it can’t function properly at the moment. But give it time and it will. In the meantime, just enjoy the show. Static Haze speculates on how the machine perceives and, in turn, communicates itself once woken up by the user during its state of rest. Blurring the line between function and malfunction, our intent was to aestheticise the latter in order to embrace its imperfections; to be delighted and excited as opposed to being frustrated. In the exploration of the machine as this being, we were interested in the transition of states from being asleep to suddenly being woken up as a metaphor to describe our attitudes of the machine. We abruptly bring them to function at will, without thinking about their state of being, yet when they malfunction, we become frustrated at them when, potentially, we only have ourselves to blame. Interested in how image could be interpreted as sound by the machine, this became the focus of our experiment as a means to show how information sent to the machine could be interpreted in different ways. Yet over time we began to contextualise this within the performance of malfunction from the machine. Using ‘Max 7’, a visual coding program, we were able to sought out an experience that could convert the video from a camera feed into a static sound and visual. The video feed is converted into grayscale not only as a way to relate back to the graphic identity of Fearful Harmony, but also to simplify the process of converting the image into sound. The way Max 7 interprets the video of a camera feed into the static experience is by taking a column of pixels and analysing its grayscale value and further interpreting it as a frequency to play as sound. As a visual, it then takes the column of pixels and stretches it across the screen. Using FaceOSC, a facial recognition program, we made it so that upon the machine recognising a human face, it would slowly distort and manipulate the user’s face until it fully turned into a static experience. But to make the transformation clear that it triggered upon detecting a human face, we needed a previous state, hence the ‘sleeping state’. In this state, white lines would appear alongside a tune, which was generated from an image of a sheep, which we then manipulated to make it sound as if the machine was sleeping. In fact, if you play this tune on a spectrogram you can faintly see an image of a sheep. The purpose of creating a sleep state was not only to make the experience clearer that it triggered upon facial recognition, but also to explore the being of the machine, speculating how it would fall asleep and how that could be experienced, while further justifying the distortion that would occur once woken. Gallery label, DHC/ART Foundation for Contemporary Art is delighted to present Ryoji Ikeda’s first survey exhibition in North America. A fascinating and troubling poet of the digital age, Ikeda’s profound investigations in sound, time, and space have their basis in mathematical methods which result in works of spare, sublime, if occasionally ear-splitting, beauty. Spanning the microscopic to the infinite, his performances, installations, and artworks variously produce sine waves, sound pulses, pixels of light, and numerical data sometimes in extraordinary combinations. The artist has conceived a conceptual counterpoint between DHC/ART’s two buildings: the main space will display framed works, light boxes, sculptural works, and works on paper under the rubric systematics. In the Satellite space Ikeda will present audiovisual projects, orchestrated as a symphonic whole, from the datamatics series which tests the limits of perception by visualizing the invisible data streams which permeate our world. 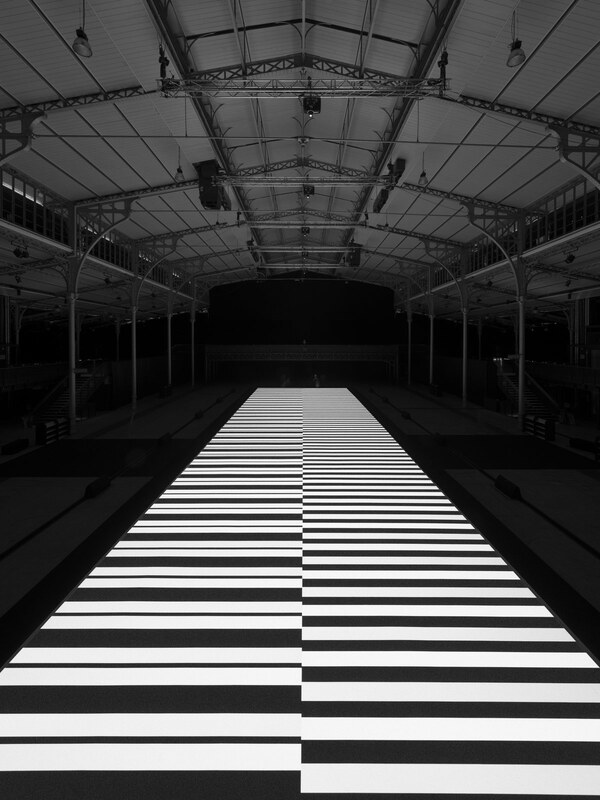 Ryoji Ikeda was born in 1966 in Gifu, Japan. He now lives and works in Paris. He has performed and exhibited worldwide including Australian Centre for the Moving Image, Melbourne; MIT, Boston; Centre Pompidou, Paris; Sónar Festival Barcelona; Tate Modern, London; Irish Museum of Modern Art, Dublin; Auditorium Parco della Musica, Roma; lCC, Tokyo; Art Beijing; Göteborg Biennale; Mutek Festival; and many other electronic music festivals and small DJ clubs. Test pattern presents flickering black and white imagery that floats and convulses in darkness on two screens, one on the floor and another floor to ceiling, in time with a stark, powerful and highly synchronised soundtrack. Through a real-time computer program audio signal patterns are converted into tightly synchronised barcode patterns on the screens. The velocity of the moving images is ultra-fast, some hundreds of frames per second, providing a totally immersive experience for visitors. The work provides a performance test for the audio and visual devices, as well as a response test for one’s perceptions. Through a real–time computer program, test pattern converts audio signal patterns into tightly synchronised barcode patterns on screen. The velocity of the moving images is ultra-fast, some hundreds of frames per second, so that the work provides a performance test for the audio and visual devices, as well as a response test for the audience's perceptions. Ryoji Ikeda, an electronic composer and a visual artist, was our maininspiration for Static Haze. 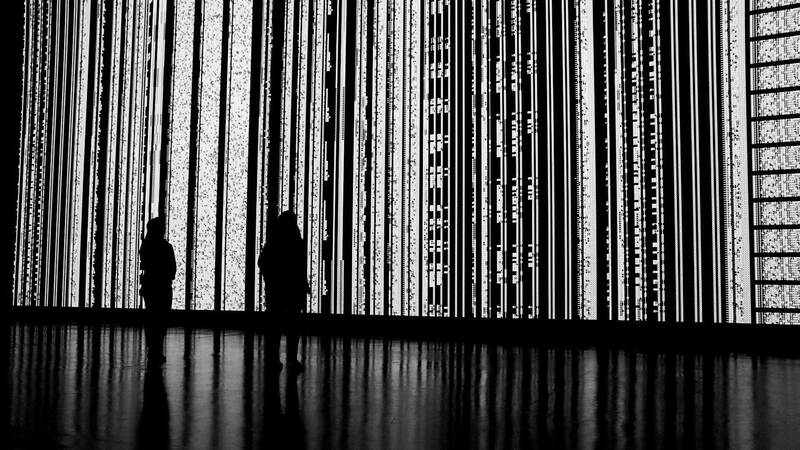 In particular, we looked to his work ‘Test Pattern’ (2008), an audiovisual installation that interprets data and sound into a barcode pattern. Though Ikeda remains relatively quiet as to the purpose of his work, we came to understand Test Pattern as an exploration of the machine transitioning into different states of activities. The idea of states for the machine to transition through then became something that we wanted to explore for Static Haze, taking the experience of Ikeda’s test pattern as a precedent for how our machine should sound and look like when either asleep or awake.